I read this article and found it very interesting, thought it might be something for you. The article is called Only Better Educated Mothers Of Grooms Can Lead To More Inter-Caste Marriages https://www.indiaspend.com/only-better-educated-mothers-of-grooms-can-lead-to-more-inter-caste-marriages/. Mumbai: Only 5.8% of Indian marriages were inter-caste, according to Census 2011, a rate unchanged over 40 years. Whilst in other countries an increase in education levels correlates with a decrease in endogamous marriages--marriages within a specific social, ethnic or caste group for the purpose of entrenching community boundaries--the education levels of individuals in India appear to have no bearing on the likelihood of marrying someone from a different caste, according to a new study. The education level of the groom’s mother is the leading determinant of an inter-caste marriage: The better educated the groom’s mother, the higher the chances of an inter-caste marriage. These are the findings of a 2017 study by the Indian Statistical Institute, Delhi, which used data from the latest round (2011-12) of the Indian Human Development Survey (IHDS-II) to examine the impact of education on one of India’s most resilient caste-based practices. This is the first time a study has looked at the impact of education on inter-caste marriages in India, highlighting stark contrasts with other countries. Studies on “out-marriages” have been conducted before in other countries, such as the US and Brazil, but they were on racial and ethnic lines. The Indian institution of arranged marriages, and consequently the unique decision-making role played by parents in pairing potential spouses, is a significant reason for differences with other countries. Any analysis on education’s impact on the prevalence of inter-caste marriages therefore “must consider parental attributes along with individual ones”, the study said. 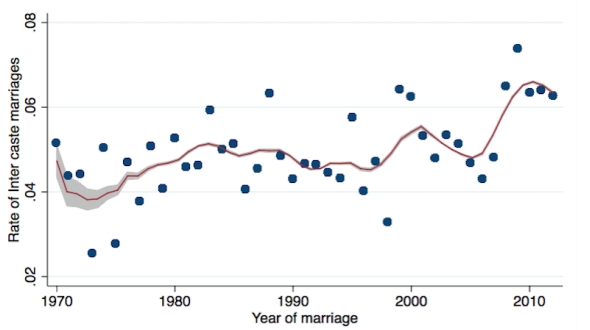 Out-marriages have typically been seen as a measure of social cohesion and a key indicator of assimilation between various social groups, particularly in the US. Marrying outside rigid caste boundaries that an individual is born into remains taboo in most parts of India, which can lead to social ostracism and even inter-family/community violence. This despite attempts--such as enshrining individual rights in the constitution and affirmative action policies--to reduce caste discrimination since Independence. In recent weeks, media reports of a caste-killing in Telangana sent shockwaves around the country. Pranay Kumar, 23, was attacked in broad daylight with a machete while leaving a local hospital with his pregnant wife. The murder was allegedly arranged by an upper-caste father unhappy at his daughter’s marriage to a Dalit man--he reportedly paid a hitman Rs 15 lakh as the first installment. A 10-year increase in the education level of the groom’s mother produces a 1.8% increase in the probability of inter-caste marriage, equal to 36% of the sample mean, according to the study. An increase in the education levels of the groom, bride or other parents show no significant impact. Why is the groom’s mother most influential in determining her son’s marriage outcomes? A better educated mother makes a household more gender-balanced and tends to yield more bargaining and decision-making power, the study suggested. Mothers in developing countries also tend to be more responsive to their child’s needs, using any available resources in their interests, compared to fathers who are more likely to spend on adult goods, such as tobacco and liquor. Hence, they are more likely to support a son’s preference for an inter-caste marriage, if the social cost is not too high, the study stated. These two factors combined mean there is a higher likelihood of an inter-caste marriage. However, the same cannot be said for the bride’s mother. She is less likely to support an inter-caste marriage, as a bride’s family generally bears more stigma than the groom’s in a marriage that transverses caste boundaries. Academics look to to ‘honour killings’--largely perpetrated by the bride’s family, in which either the bride or both of the spouses are killed--for anecdotal evidence of this relationship. Families and close relatives are still the “main players in the marriage market in India”, holding inordinate levels of decision-making power, said the study. As many as 73% of respondents to the IDHS-II survey said their marriages were arranged; of those who had chosen their partners, 34% still only met their future spouse for the first time on their wedding day. This also holds true for inter-caste marriages, where 63% did not meet before their wedding day, indicating that the majority of these couples barely knew each other before, limiting the extent to which these could be viewed as “love matches”. While 27% of women surveyed believe they chose their own partner, they may have had negligible roles in the decision-making process, and this number could be exaggerated, the study said. Further, 98% couples in inter-caste marriages also lived with parents after marriage, reinforcing the idea that these marriages are sanctioned by both families, rather than a rebellion against the machinations of the Indian marriage market. “Caste endogamy it appears, is much more pervasive than expected in the face of economic development and the expansion of market forces,” the study said. Though the accepted belief is that arranged marriages decrease and out-marriages increase as a result of social changes enforced by industrialisation, education and urbanisation--known as the modernisation theory--the low-rate in inter-caste marriages in India refutes this trend. There has been no increase in the rate of inter-caste marriages over time, and during a period when urbanisation increased in India, remaining at roughly 5% between 1970-2012. The average for 2000-2012 is marginally higher than 1971-80 and 1981-90 but not statistically different from the previous decade, 1990-2000, the study said. No more than 11% of Indians lived in urban areas in 1901, compared to 34% (460 million) in 2018--a figure which is predicted to rise to 600 million by 2030, according to this 2018 United Nations report. Indeed, metropolitan areas have a lower rate of inter-caste marriages (4.9%), compared to 5.2% in rural areas. The comparative economic status of both families at the time of marriage also had no effect on the rate of inter-caste marriages, with the rate actually going down as household assets and income levels increase. Richest households by assets had an inter-caste marriage rate of 4.0%, compared to 5.9% for the poorest. Whether the husband’s family had the same, better, or worse status than the wife’s family at the time of marriage had no bearing on the inter-caste marriage rate. Far from being love marriages, inter-caste marriages then are most likely to be optimum and family-sanctioned matches that serve as a form of status exchange in the established marriage market. Discrimination still exists, however, and there can be a premium attached to income and class. Interest in inter-caste-marriage was found to increase with income among scheduled castes (low-caste groups) but decrease with income among high-caste groups, according to this 2016 survey of 1,070 upper-caste females from Uttar Pradesh, Maharashtra and Tamil Nadu.